Is Eating Canned Tuna Safe During Pregnancy? A US-based non-profit Consumer Reports unequivocally recommends pregnant women steer clear of all tuna fish, including canned, because of concerns over mercury. 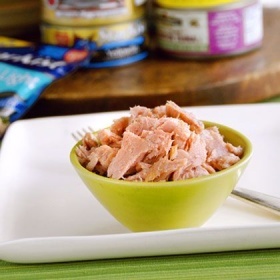 While Health Canada and the US Food and Drug Administration recommend avoiding fresh and frozen tuna during pregnancy because of its high mercury levels, light canned tuna (made from a smaller species of tuna, and therefore lower in mercury) has been deemed by both a safe bet when eaten once or twice a week. Consumer Reports’s new research, however, states that despite light canned tuna’s safer reputation, it’s best to avoid it during pregnancy because of occasional spikes of high levels of mercury in the fish, which are impossible to spot on a can-by-can basis. This research was published online Thursday and will appear in the October 2014 issue of Consumer Reports magazine. So what’s a confused mama-to-be to do? Don’t give up on fish; it’s really important to eat this protein-rich food during pregnancy, particularly fatty fish like herring, mackerel, salmon, sardines and trout. These are the best sources of omega-3 fatty acids (specifically DHA and EPA) that support fetal growth and brain development—and fortunately they’re low-mercury choices. Health Canada recommends at least two servings of them a week. If you’re pregnant and like the convenience of canned tuna, Consumer Reports cites canned salmon as an excellent low-mercury substitute (you’ll just have to pick out the bones). If not canned seafood, what can pregnant women take? 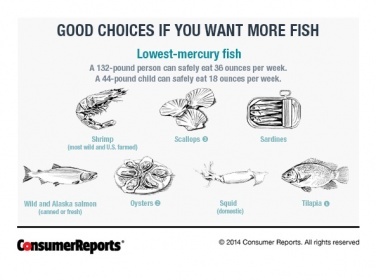 The FDA and EPA say most women and young children should avoid the first four highest-*mercury fish below. They’re considering adding the last two to the list. 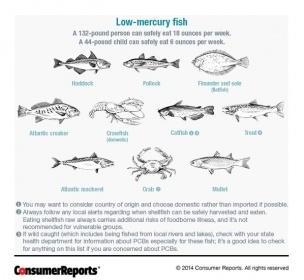 If you are a frequent consumer of any type of fish—24 ounces or more per week—Consumer Reports suggests that you avoid the fish *below as well. This article is originally published on Today’s Parents.